Father, is that an iPad you're holding? Preparing the Missal The Rev. 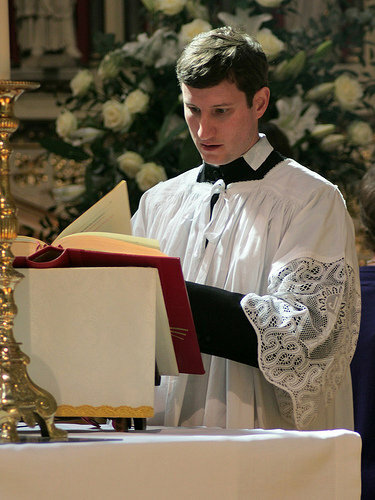 Daniel Seward prepares the missal at a service at Oxford Oratory in April. An Italian priest is launching an iPad app that will make the entire Roman missal available in electronic form. via Flickr/ James Bradley. Want to conduct Sunday Mass but don't have your copy of the church missal? There's an app for that. The Rev. Paolo Padrini, an Italian priest who consults with the Vatican, is launching a free iPad app that will contain the complete Roman missal -- the book containing everything that is said and sung during Catholic Mass throughout the liturgical year. It will be available in July, meaning iPads could start appearing on altars in the next few weeks. Future editions will feature audio as well as commentaries and suggestions for homilies, AP reports. It's not the first time that 2,000-year-old prayers will be available in app form. Padrini already has an iPhone app called the iBreviary, which contains the book of daily prayers used by priests. To date, 200,000 people have downloaded it.